We took a minute to ask one of our favorite kids designers some questions. From colors to patterns, Liz Colley has represented a fresh look on children quilts and bibs in LAB Brooklyn. Tell us a little about Colley Designs? 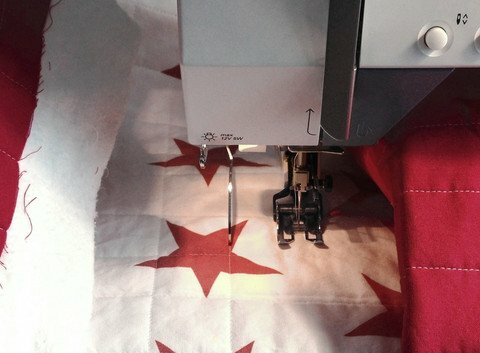 All Little Colley Design quilts and bibs can be ordered in any size or color because I design my own fabric. The fabric is printed in America in an environmentally conscious way. I do all the sewing and quilting myself (in my basement studio which I lovingly refer to as the "sweat shop"), nothing is outsourced or imported. The items are all designed to withstand normal machine washing and drying because it was very important to me that anything made for a baby must also be easy for parents to care for. I wanted these quilts and bibs to be modern, but also family friendly. I love EVERYTHING about what I do. From designing a fabric, to playing with colors, to finishing a quilt; I love it all. I get great joy out of designing and creating baby items that are both beautiful and utilitarian. Four years ago, while I was decorating my son's nursery, it was hard to find any baby bedding in black and white. I utilized my background as a graphic designer and taught myself to quilt so I could then make the modern baby bedding I wanted for my own home, and Little Colley Design was born! And what are the top 3 things that inspire you? I am currently most inspired by the watercolor artist Agnes Cecile, any kind of minimalist nordic Christmas decorations, and the amazing hand dyed fabrics by Kim Eichler-Messmer.